these are the parts you need to build the best damn 12v power supply for lipo charging or anything else. Basically all of the links on this page are affiliate links. Read our Affiliate Link Policy for more information about that. Instructions for getting the PSU to power up are here. After you get the PSU to power up, simply solder 12 gauge silicone wire to the 12v and ground output pads, then solder an XT60 or 4mm bullet connector to the wire, depending on which connector your charger takes. Of course, you can solder on any type of connector you want... for example, a barrel plug can be useful for powering accessories that were originally intended to work with "wall-wart" style transformers. You'll need some way to plug the power supply into the wall. The cord above has a U.S. style plug, but the power supply takes both U.S. and International voltage. If you're not in the U.S., just buy a power cord with whatever plug suits you. One resistor, 330 Ohm to 1 kOhm. It's hard to buy just one resistor, so here is a link to a kit. iSDT chargers take an XT60 plug as their input power source. This is to allow them to be powered from LiPo batteries in the field. You can install the same plug onto the Power Supply. 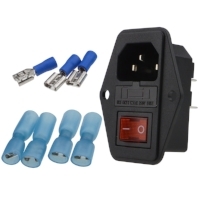 These banana plugs are used for input power on many chargers. Make sure to buy the 4mm size! If your charger takes banana plugs, here's a simpler approach: just buy this extension cable and cut off the female end, then solder it to the power supply. 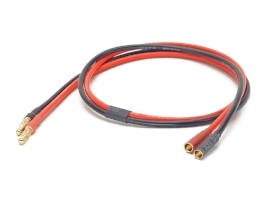 If you don't want to build your own XT60 lead, here's a pre-made one. Just cut off whichever end your charger doesn't use and solder the remaining wires to the power supply. The items above are the minimum that you need to get the charger going. But if you want to go further, check out what I built! I don't have a set of instructions for how to build this. Frankly, since it involves working with mains power, I'm not sure I will ever make them! But if you want a list of parts that I used, here they are. This plastic ammo can makes a great project box for your power supply. The plastic means it's easy to make cutouts with a dremel or drill. This display shows the mains voltage going into the power supply, as well as amps and watts consumed. This is especially useful when running the power supply off a generator. These binding posts will get the job done for making plug-in jacks in your case. I never did figure out the best way to connect a wire to them. I used ring terminals. If you put your power supply into a case, you need to add some fans to keep it from overheating. I mounted this fan on the inside-back of the case. 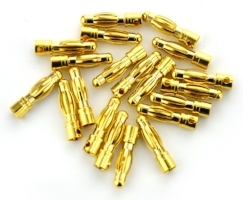 These are the screws you'll use to hold the case fan up against the case. These filters will keep dust and dirt out of the case. I put two 40mm filters in the lower-front of the case as an intake and one 80mm filter on the fan in the back of the case. You need one of these fan controllers to make the fan spin. As a bonus, it'll let you control the speed of the fan, but to be honest, I just run it at full speed all the time. 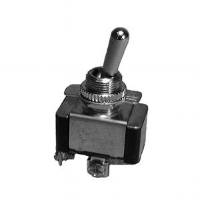 This is a 120v-rated on/off switch. Wire power to the PSU through this switch to let you turn it on and off. If you're using 220v power, don't use this switch. Your power wire needs to go from the outside of the box to the inside. The proper way to do this is with a pass-through receptacle. But I just used a rubber grommet and passed the wire through. I put a loose overhand knot in the wire, inside the box, as strain relief. You take all respnsibility if you choose to do it this way. This C14 receptacle is the proper way of passing power from the outside to the inside of the case. As a bonus, it's fused. The main reason I didn't use this is that there wasn't a convenient place to fit it onto the case. If you use this receptacle, you don't need a separate on/off switch. If you’re feeling particularly brave, you can combine two of these power supplies to get 24v output. This is especially good because most lipo chargers don’t make their full rated output on 12v input. This video has full instructions. PERFORM THIS MODIFICATION AT YOUR OWN RISK!! !